To slow global warming, we should phase out cows. Bovine flatulence is often a source of scatological humor for those making light of greenhouse gas emissions (GHG). However, cattle generate 5 gigatons of CO2 equivalent, annually. More precisely, they produce methane. A chart used by Bill Gates reveals that cattle produce almost as much in harmful emissions as the U.S., and half of China. The global cattle herd wouldn’t have to be summarily executed – simply allowed to die out with no new replacement cows. On average, cows live about twenty years. If the world could eliminate an America’s-worth of 2018 GHG emissions by 2039, why isn’t that a reasonable option? The U.S. has 6% of the world’s cattle. As with many issues of global warming, the problems are elsewhere. Based on headcount, 35% of bovine emissions come from Brazil, India and China. 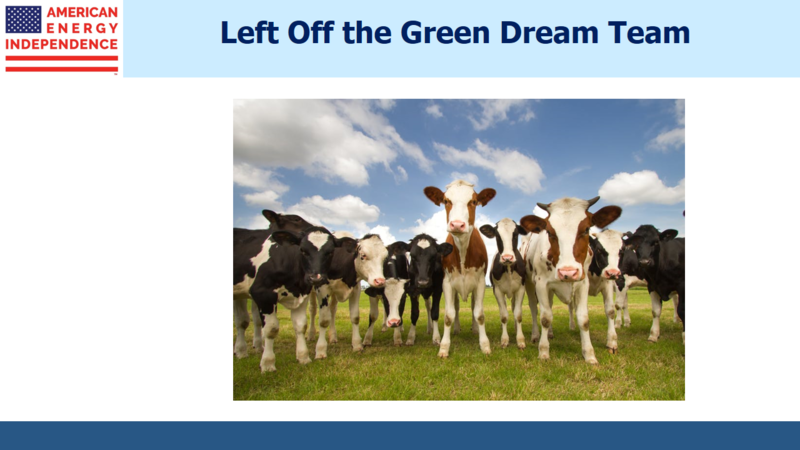 The proposed Congressional resolution that incorporates the Green New Deal (GND) doesn’t include the end of cows. Curiously though, a Q&A was posted on the website of Representative Alexandra Ocasio-Cortez (a co-sponsor) that implied the eventual elimination of “farting cows and airplanes,” although this was soon taken down (still available here). This is what making policy on the hoof looks like. The sponsors also considered a twelve year deadline for the elimination of fossil fuels in America, but omitted it from the final language. This is more disruptive and expensive than dealing with cows, and happily even less likely. The Green New Deal is hopelessly unrealistic. Even Nancy Pelosi referred to it as the “Green Dream”. The document’s solutions are neither realistic nor practical. The country can’t start producing more of everything, with no negative externalities, at lower cost. Electric engines won’t power airplanes or cargo ships anytime soon. Given current technologies, electricity generation and light duty vehicles (around one third of GHGs) are currently the only plausible targets. Only a small portion can be converted economically. Like much else in politics, extreme views are adopted to motivate core supporters. Socialist ideas in the GND, such as free college, “high-quality union jobs” as well as Federally guaranteed jobs are not related to the environment. Including a grab-bag of left wing ideology adds a juvenile feel. Last year’s report from the UN’s Intergovermental Panel on Climate Change (IPCC), warned of the planetary risks from increased GHG output, which is caused by humans. Its most famous soundbite is its call to limit future global warming to 1.5 degrees C above pre-industrial levels. The science around the climate is complicated. Scientists have been predicting catastrophe from rising GHGs for years. You can find serious forecasts from the 1980s showing New York City submerged by now. The IPCC seeks to aggregate the best scientific analysis. It shouldn’t be dismissed out of hand, even though like past efforts, it could be overstating the problem. So far, planetary warming is noticeable to some but not that disruptive. Nonetheless, most people would agree to some reduction in GHG emissions, if the cost/benefit trade-off was acceptable. The GND doesn’t speak to them. It seems you have to be aligned with the extremists, or you’re opposed. Cheap, accessible energy is a key driver of rising living standards. The planet may be warming somewhat, but so far the benefits to humankind have been enormous. Put aside for now our energy-dependent lifestyles in developed countries – in emerging economies, there’s a direct link between increasing energy consumption and longevity. Alex Epstein’s The Moral Case for Fossil Fuels defines the issue around what’s good for humanity. Indonesia is just one example of a country where energy has led to cleaner water and better hygiene, leading to longer, healthier lives (see Guess Who’s Most Effective at Combating Global Warming). Science is driving the concern about global warming. A serious effort to limit GHG emissions also accepts the science-based limitations around relying exclusively on renewables. Most obvious is the inability of batteries to efficiently store the energy produced by intermittent solar and wind for later use. Estimates of the GND’s required investment run into the trillions of dollars, and rely on advances in technology not currently in sight. Away from the extreme fringes of debate, nuclear power is recognized as part of the solution (including by IPCC). Natural gas is a cleaner alternative to coal, and in being available when solar and wind are not, it improves the utilization of renewable supply. Environmental activists oppose these and other plausible strategies to advance their goals. Pipeline opponents cause Canada to move its crude oil by rail (see Canada’s Failing Energy Strategy), and Boston to import liquefied natural gas from Russia instead of Pennsylvania (see An Expensive, Greenish Energy Strategy). Today, fossil fuels provide around 80% of the world’s energy. Inflexible opposition to what works without practical alternatives risks enormous disruption, more expensive energy and lower living standards. In America, the pursuit of extreme solutions risks provoking opposition to even reasonable ones. For poorer countries, it means giving up aspirations for healthier lives. We invest in energy infrastructure, and we care about the environment. It’s our planet too. The issues are too important to be left to extremists.